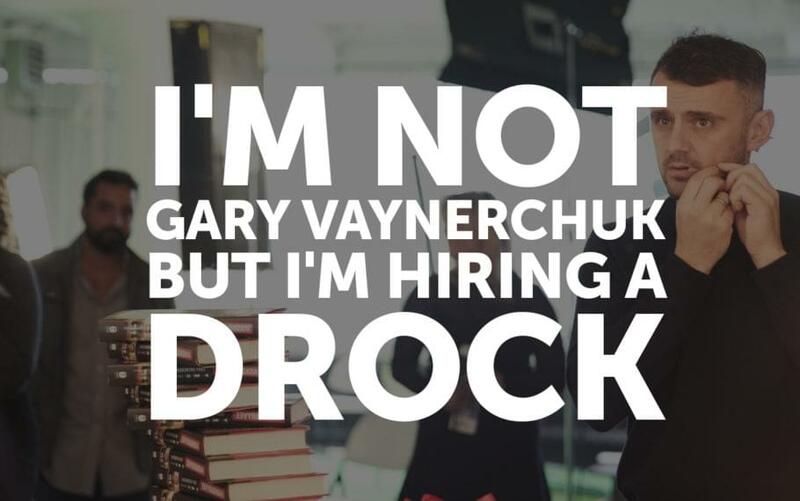 If you’re a fan of Gary Vaynerchuk, you know about DRock, and that means you know exactly who I’m looking to hire. For the rest of you, allow me to fill you in. DRock is David Rock, and he works as a videographer for Gary Vaynerchuk, who is kind of a big deal these days, if you’re in the US and you’re super into entrepreneurship, startups, and frank talk. Gary was an early investor in Twitter, Facebook, and Tumblr, but before that he worked as a quasi-slave in his father’s liquor store, until he took that $3M store and turned it into a $60M store by selling liquor online. In 2014 DRock saw Gary speak, was inspired, and later contacted him (multiple times) and hustled his way into a job filming the daily life of Gary. Part of the fruit this relationship bore is the #AskGaryVee show. People send Gary questions, and he answers them. DRock films it, edits it, and puts it online. The show has turned Gary Vee from a guy who did well with an online liquor store, and then as a tech investor, and then as the founder of a digital marketing agency with 700 employees, into a huge celebrity. Ok, ok, he was already a bit of a celebrity before with a bunch of bestselling books, but the #AskGaryVee show made him HUGE. Can I Be the Next Gary Vaynerchuk? There are a lot of people asking themselves that question, but I’m not one of them. I’m not Gary, and I’m not going to try to be him. If I thought I could copy him, and I had $25K/month to blow, I could hire the service Gary launched for celebrities (or anyone with substantial pocket change). Although I’m not Gary, there are lots of things he has done, parts of himself, that I want to reverse engineer for myself, especially the practice of documenting one’s business life. This is is something I’ve been interested in since I was 10 years old. In 4th grade, when I was attending Anoakia Elementary in Arcadia, CA, I read a book. I have no idea what the title was, and no idea how to find out, because I don’t remember enough about it (if my following description rings any bells for you let me know). What I remember is that it was set in the future, and the main character was some sort of street fighter reality TV star. He had mini-drones that followed him around all the time and filmed everything he did, broadcasting it to a live audience. He’d get in fights with people on the street, and viewers would watch it in real time. I’m not into fighting and I’m not into celebrity, but I’ve always been interested in documentation. From 2001 to the present day I’ve maintained my personal blog, documenting my business life through thousands of blog posts, but I’ve never cared that much if people read what I wrote, I just enjoyed writing it. That isn’t to say I’m ignoring the business benefits–writing for Forbes and other publications has generated millions for my agency, and I know creating content on video would also come with financial benefits. That’s how I justify the investment, even though I’d be tempted to make it regardless. But up until now I’ve only dipped my toes. My attempts to document my business pursuits on video haven’t so much failed, as I’ve failed. I’ve tried the self-documentation thing on video. The technology isn’t the hard part, although it can be inconvenient due to the learning curve, no, the real challenge is the time commitment. I don’t have time to spend taking video of myself, and even less time to edit it. That’s why when I saw what Gary Vee was doing with DRock, I thought “That’s it! That’s what I need. I need a DRock.” I’ve had people who have been generous enough to help me out as I’ve experimented with this on a part-time basis but it’s not enough, I need someone full time, someone I can invest in for the long term. It’s one thing to have a need, and another thing to be able to pay for it. DRocks don’t come free, or even cheap (again, see the $25K/month option above). Hiring my own DRock means hiring a full time employee and buying him a bunch of expensive camera gear. Then I’ll be paying for him to jump on planes and follow me around. Then there’s lodging and meals and Swedish Fish and his phone bill and it all adds up. I could have my agency, MWI, hire a DRock for me, but we’ve got a lot of other priorities. However, lately I started coaching executives on how to become influencers, and that’s generating an income outside of my day job which has allowed me to hire on several virtual assistants, and now it’s financially feasible for me to find my DRock. Why am I discriminating against females? Because this person is going to be traveling with me, a lot, and I don’t believe my wife would take too kindly to me galavanting all over the world with another woman. If you don’t like it go ahead and sue me. I know 10 years is a long time, and I’m not asking for that kind of commitment, what I’m saying is that I’m not going to hire someone who already has plans that conflict with a 10-year stint. If you’re planning on going back to school in 3 years, then this isn’t for you. But if you take this gig and 3 years from now you meet a girl and you get married and have kids and she doesn’t want you traveling all over with me all the time, I get it, these things happen. What will you be documenting? My agency MWI as it grows globally and opens offices. The creation of Influencer Inc, a publishing/education/training empire. My speaking and consulting gigs around the world. My visits to businesses large and small around Asia and the rest of the world. There is also a need to do the same for other team members at MWI, Influencer Inc, as well as for some of my coaching clients. But it’s not just documenting my life or those of my team or coaching clients, it’s also content creation. I’m developing courses and need to create lots of videos to go along with them. I’m not Gary Vaynerchuk. I don’t travel around the world business class, not yet, anyway. I don’t have millions of dollars laying around from bestselling books and amazing investments. That said, I’m also not asking anyone to work for free. In addition to a paycheck you’ll get the opportunity to travel the world, tour interesting businesses, see the sights, meet great people, and meet great famous people (I spent a week earlier this year on Richard Branson’s island–wish you could have been there). You’ll also get to know that you’re making a difference in various entrepreneurial endeavors and doing something that a lot of people are going to see. You’ll get to play around with the latest equipment and software, be a video expert, and you’ll get to do it all on someone else’s dime. Sound like something you’d be interested in and qualified for? Shoot me an email at josh@mwi.com with links to samples of your video work. Want to take a guess how long it took for me to find the first great match? 24 hours. That’s how long it took for me to get an email from a guy who was a film student in Boston, who had lived in the UK for four years of schooling, is a native of Shenzhen, China, where I’m living right now, speaks Mandarin and Cantonese, and isn’t a skater, but he did have some video work he had done filming skateboarding. A few days later I was contacted by the guy who has actually become my DRock. His name is Jay. He lives in Shenzhen, about 30 minutes from me. He has great English, but is native Mandarin and Cantonese speaking. He’s 30 and has been in film for 10 years. He has friends he can pull in to work on larger projects. And he’s a full-on skater and has made skate videos. I couldn’t ask for a better fit. When we first met we were both blown away at how well he fit what I was looking for. We’ve already made several videos filming together, which you can see on my personal and business channels. That said, I’m still interested in talking to other videographers, because I have clients who need your services, and I’d also like to have backup.